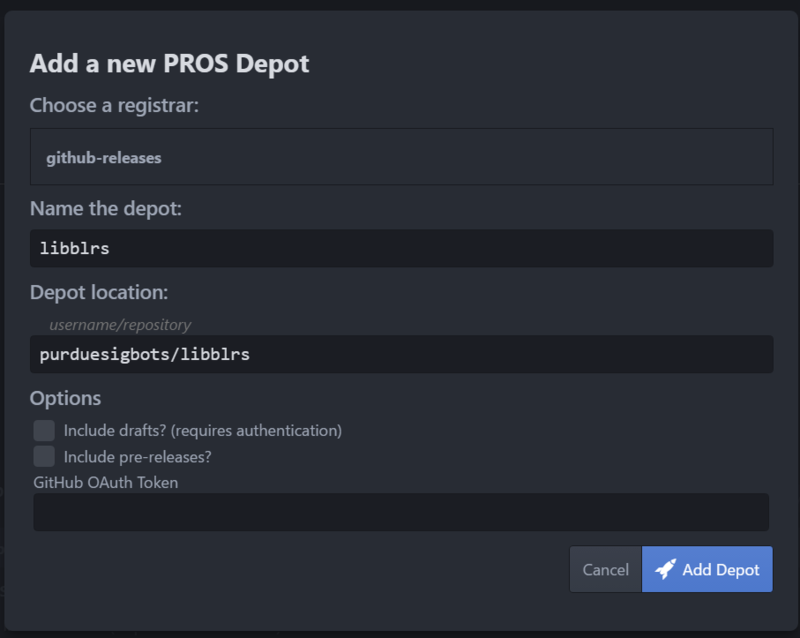 PROS supports the concept of adding libraries, allowing you to modularize and share code with others. PROS libraries can be any set of files, but are typically a collection of precompiled code with some header files. Under Construction This section of our documentation is still under construction. Atom documentation is coming soon. Using Atom, you can open the PROS Conductor by pressing Ctrl + Shift + P, then typing Conductor. Scroll down to the Global Configuration section and add a depot. You may leave the rest of the options blank. Now, you should see the various libraries offered by the libblrs repository. You can download whichever libraries you would like to use now by clicking on the download button. Next, you should open the project you want to add a library to, if you have not already done so. Select the project in the Conductor window and click “Add Library”. Select the library you want to add and click OK. You will now have access to the capabilities provided by the library! You should change LIBNAME, VERSION, TEMPLATEFILES, and TEMPLATEOBJS to fit your project. Then to build the library, run pros make library. Next, you will need to zip the template directory. The zip file should not contain the libfbc-template directory (that is, the root of the zip file should contain template.pros and all your other files). Next, you should create a release on GitHub and upload your template(s) to the release. You can see Purdue SIGBots’ repository at purduesigbots/libblrs.